The ADA has a number of requirements related to structural accessibility. The law provides specific accessibility standards for building design, construction, and alteration projects undertaken by entities covered under Title II (state and local governments) and Title III (public accommodations and commercial facilities). Additionally, architectural barriers in existing buildings may need to be removed in some cases, or alternate methods used to enable people with disabilities to obtain goods and services. There are no specific design, construction, or alterations requirements that apply to covered employers, although many entities are covered both as employers and as public accommodations, commercial facilities, or state/local government agencies, and therefore have separate obligations under Title II or Title III in relation to facility access. However, the duty to provide reasonable accommodations to qualified applicants and employees may require an employer to make structural modifications in the workplace. Reasonable accommodations are approached in an individualized fashion, though. Rather than merely following standards, an employer may need to modify, in a manner that meets a particular worker’s needs, only those structural elements that present problems for that worker. For example, minimum accessibility standards require a clear width of 32 inches at accessible doors, but an individual worker who uses a larger mobility device may need 34 inches of clear width to get through doors. As long as it is not an undue hardship, an employer may need to widen to 34 inches a number of doors throughout the workplace (the individual’s office, the restroom, the conference room, the employee break room, etc.) to enable the individual to work and gain access to related common spaces. Public entities (state and local governments) are subject to Title II and must comply with specific minimum requirements when they build new facilities or alter existing ones. Public entities may only follow the new ADA standards (2010 Standards). The 2010 Standards became mandatory on March 15, 2012; public entities no longer have other options. When state and local governments offer programs or services in existing buildings, the programs must be assessed to determine if there are structural barriers that interfere with participation for individuals with disabilities. Where such barriers exist, the public entity must take steps to ensure that individuals with disabilities can access services and participate in programs. Public entities can use a variety of methods to facilitate participation. They may choose to make structural improvements to existing facilities or even build new facilities, but they may also consider relocating events to alternate facilities, providing equipment or staff assistance, home delivery, or other options. Whatever methods are used should enable people with disabilities to participate in the most integrated fashion possible. For example, if an individual who uses a wheelchair registers for a class that is scheduled to be held on the second floor of an old building without an elevator, it would be better, if possible, to relocate the entire class to a nearby accessible location, rather than sending an instructor to the individual’s home to teach her alone, while the rest of the class meets as a group in the inaccessible location. Although structural improvements to existing buildings are not necessarily required, they are often the most efficient way to achieve integrated and meaningful participation for people with disabilities. While some programs or services will lend themselves more easily to “off-site” alternatives (e.g., obtaining or filing tax forms), other programs will be difficult or impossible to provide effectively outside the typical structural locations (e.g., a swimming class). 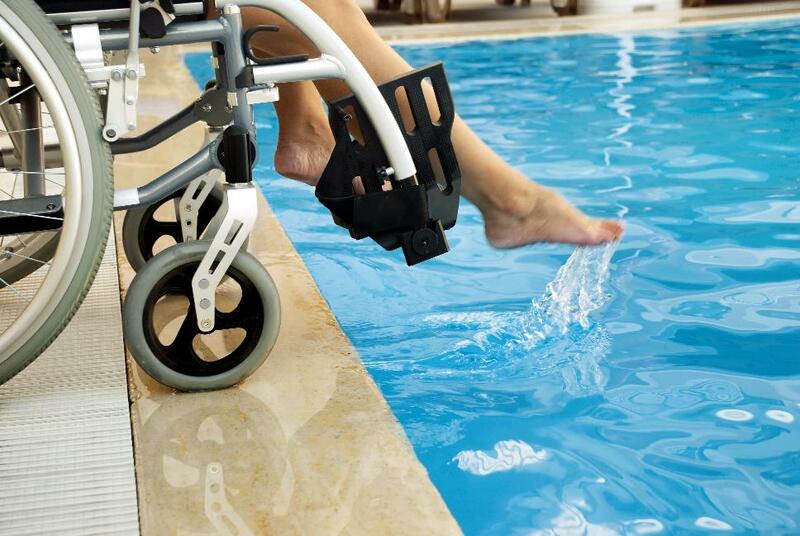 Additionally, methods that allow people with disabilities to participate the same way others do, without the need for things like rescheduling, obtaining equipment, or arranging for staff assistance, will be less burdensome on staff as well as on people with disabilities, and therefore may be more cost-effective in the long run as well. For more information for public entities, visit our "State and Local Governments" page. Public accommodations (a variety of private business such as retail stores, restaurants, theaters, doctors’ offices, dry cleaners, banks, etc.) and commercial facilities (factories, warehouses, etc.) are subject to Title III and also must comply with specific minimum requirements when they build new facilities or alter existing ones. Public accommodations must follow the ADA standards (2010 Standards). The 2010 Standards became mandatory on March 15, 2012; the 1991 Standards are no longer an option. Public accommodations are required to remove barriers in existing facilities when it is “readily achievable” to do so. Readily achievable actions are those that are easily accomplished, without much difficulty or expense. Commercial facilities are not subject to this “barrier removal” obligation in relation to existing structures. Both structural and financial limitations will determine what barrier removal actions are readily achievable at a given point in time, but the obligation is a continuing one, so it is important for businesses to revisit the issues on an on-going basis. Where barrier removal is not readily achievable, public accommodations must also consider alternate, readily achievable methods to provide their goods and services to customers with disabilities. Methods may include providing assistance retrieving items, home or curb-side delivery, or other options. For more information for businesses, including information on operational issues as well as facility access, visit our "Retail / Services" page. “Scoping” is a term used to refer to the requirements that establish which spaces or elements, or how many, need to be accessible. “Technical specifications” are the requirements that describe what accessible spaces and elements look like. For example, if a county government builds a new parking garage, scoping provisions will tell them how many of the parking spaces in the garage need to be accessible. Technical specifications will tell them what those accessible spaces need to look like, including the width, slope, signs, and more. It is important for designers and facility owners to be aware of other codes, laws, and rules that may affect building projects. The ADA does not negate other federal, state, or local laws or codes. Rather, a given project must comply with all laws and codes which apply to it. Designers, builders, and owners must determine which laws apply, and then compare each applicable code or standard and determine, on an element-by-element basis, which is more stringent (provides for better accessibility). For example: a county government is building a new park that will include a large children’s playground, restrooms, and a parking lot with 125 spaces. Title II of the ADA applies to the project; state codes apply as well. The project must comply with both standards. Perhaps the ADA standards are more stringent in relation to the playground, setting out requirements for accessible play components, ground surface, etc., while the state code has no requirements related to playgrounds. At the same time, the state code is more stringent in relation to scoping requirements for the parking lot, requiring that one in every four accessible parking spaces be van-accessible, while the ADA only requires one in six. The park must provide both an accessible playground in compliance with ADA standards and the parking lot must provide two (rather than only one) van-accessible parking spaces in compliance with state code. The 2010 ADA Standards can be accessed at the US Department of Justice’s ADA website. The Standards include scoping provision for pools and spas in section 242 and technical specifications for pools and spas in section 1009 .